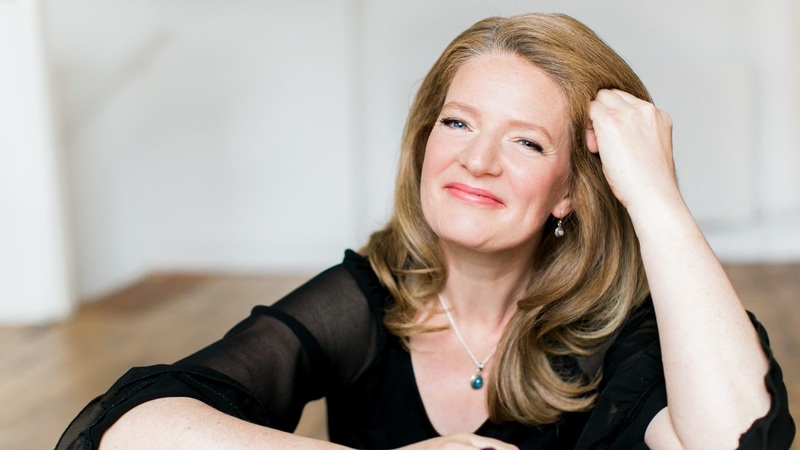 For their joint concert at Kings Place, violinist Rachel Podger and vocal ensemble Voces8 took Biber's Rosary Sonata No. 16 (Passacaglia) in G minor for solo violin Guardian Angel as their starting point to present a programme which explored the idea of angels whilst also exploring the intriguing combination of violin and vocal ensemble, with adaptations of music by Thomas Tallis and Thomas Tomkins, James MacMillan's Domine Non Secundum Peccata Nostra for choir and violin and a new work by Owain Park Antiphon of the Angels written specially for Podger and Voces8. We also heard music for solo violin and for voices performing separately, with Rachel Podger giving us Bach's Partita for flute in A minor, BWV 1013 (transc. into G minor for solo violin) , with Voces8 interspersing the movements with music by Gibbons, Monteverdi and Gabrieli, and there was also music by Jonathan Dove, Rachmaninov and Mendelssohn, an eclectic mix indeed. Each half played without a break, forming a sort of continuous meditation on the theme, and for the first half Rachel Podger was alone on stage and Voces8 popped up in various locations around the auditorium. This combined with the highly dramatic changes of lighting gave a somewhat restless feel to the proceedings, and the lighting prevented us from reading the texts to the vocal items. We opened with Orlando Gibbons' Drop slow tears, followed by the plainchant Pater noster, and then Biber's Rosary Sonata no. 14, a rather striking sequence. 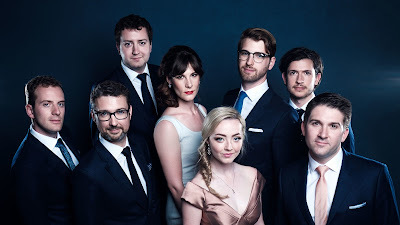 Voces8 sang with beautiful tone and blend, in an intimate way with their own particular vocal approach which gives quite a modern, smoothly blended sound to the Gibbons. Here, and elsewhere in the programme, I found their approach a little too distinctive for my taste, but could not fault the superb musicianship. Rachel Podger gave a wonderfully poised account of the Biber, combining this with a nice flexibility as she made the elaborate decorations in the violin line seem a natural part of the music. It is an amazing piece, and it is very striking how much harmonic underpinning could be implied from just a little double stopping. Jonathan Dove's Into thy hands sets a pair of prayers by St Edmund of Abingdon, a deceptively simply piece which moved from unison and homophony to more complex textures, with the singers creating a very evocative and concentrated effect. This led to three violin pieces by Nicola Matteis, an Italian baroque violinist who visited London, Passagio rotto, Fantasia and Movimento incognito. We started with vigorous Italianate string crossing, and moved through slow and fast dance measures, but always highly elaborated. Felix Mendelssohn's Denn er hat seinen engeln befohlen uber dir is the solo octet from Elijah (though the piece had an earlier life as a motet), and Voces8 gave it a nice clarity. Sung quite swiftly, the group's intimate style of performance suited the piece. Bogoroditse Dyevo from Rachmaninov's Vespers, quite light in style but beautifully shaped. For Thomas Tallis' O nata lux Voces8 was joined by Rachel Podger who doubled the high soprano line, an interesting effect which complemented Voces8's rather distinctive way with the music. The first half finished with everyone on stage finally, to perform James MacMillan's Domine non secundum peccata nostra written for choir and violin. This used an evocative, sustained close harmony texture for a refrain which had the violin moving from delicate string crossing to a more singing line which complemented the upper choral parts. The result was a fascinating combination of timbres and textures. Between repeats of this refrain, MacMillan included more dramatic passages for choir, sometimes alone and sometimes alternating with the violin; there was one terrific passage with strong homophonic textures next to violin pizzicato. An innovative piece, which successfully solved the problems innate in writing for choir and violin. The second half opened with Thomas Tomkins' When David heard performed by just four singers with Rachel Podger, the violin taking the fifth vcal line. An interesting idea, and sung here with a very straight, direct sound which worked very wall and was subtly different to Voces8's usual style. The remainder of this section consisted of Bach's Flute Partita in Rachel Podger's transposition for violin. This moved from lots of flexible string crossing, to a lively Corrente that you could easily have danced to, to a rather affecting Sarabanda and finally a wonderfully vivid and rhythmic Bouree Anglaise. In between the movements we heard Voces8 in a quietly lovely account of Monteverdi's Adoramus te Christe, where the more rhythmic passages seemed too smoothed out, Orlando Gibbon's Hosanna to the Son of David which contrasted vigorous rhythms with quiet and intimate, and Giovanni Gabrieli's Angelus Domini descendit which again brought out the contrasts in textures. We finished with a new work written specially for Voces8 and Rachel Podger, Owain Park's Antiphon to the Angels (the work premiered earlier this week at St George's Bristol), setting texts by St Ambrose and Hildegard of Bingen. Opening with a hymn-like passage, this led to a lively texture which rather reminded me of Jonathan Dove in style. Park's multi-sectional approach to the piece used the violin as connective tissue with a series of striking violin solos, but he also combined his forces, most memorably in a passage which mixed sustained close vocal harmonies with violin trills. Finally after becoming quite complex, the material worked its way round to the opening material, this time with violin cantilena. This was a striking concert, with a rather eclectic programme whose vocal items were very much linked by Voces8's vocal style. The combination with Rachel Podger's violin was intriguing, and it was fascinating to hearing so many imaginative solutions to the balance problems inherent in massed voices and violin.